Conlangs - What are Conlangs? ​​Glossopoeia is the Latinized version of the ancient Greek word γλωσσοποιΐα (glōssopoiía) = the making of tongues​. Therefore, a glossopoeist is a creator of languages. ​​A constructed language (sometimes called a conlang) is a language whose phonology, grammar, and vocabulary have been consciously devised. It is also referred to as an artificial, planned or invented language. 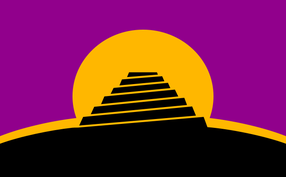 ​The Conlang Flag is a symbol of language construction which represents the Tower of Babel against a rising sun. Want your own constructed language?! Glossopoeist.com has teamed up with Kyber Consulting! Create plausible and realistic languages for RPGs, fantasy and science fiction, movies or video games, or international communication... or just learn about how languages work from an unusual, light-hearted perspective. Writers have always endeavored to create new forms of expression, not only in the English language, but in languages that exist only in their own imaginations. The Jargon of the Glossopoeist! Artlang: Short for "artistic language." A language created for artistic or specific purpose. These would include languages like Elvish from Tolkien, Dothraki from GoT, Klingon for Trekkies and of course Tho Yor. ​ Auxlang: Short for "auxiliary language." These conlangs are designed to be an "international" or "world-wide" language. The most popular example of this is Esperanto. Babel text: Genesis 11:1-9 is frequently used by conlangers as a translation exercise. To see the text click here. Canon: The "official" source of information on a particular conlang. Conlang: Short for "constructed language." Conlanger: One who invents languages. Natlang: Short for "natural language." Glossopoeia: (gloss-o-pea-ah) Another term for the artistic construction of languages. Naming language: used for the purpose of creating names for people, places, and things either in fictional environment. Neography: a writing system designed for a conlang (or even a natlang like Aurebesh from Star Wars). Very easily considered the grandfather of modern conlang linguistics, Tolkien created in depth and vivid languages for his books. He explained that the art of creating a language, "...will breed a mythology." Here is a video of him speaking one of his Elvish languages. The rock star in the modern conlanging world. He is most notable known for his Dothraki and Valerian languages from Game of Thrones.